If you have seen Shawn of the Dead (you have – haven’t you?) you know how a common zombie looks like: The skin is pale, the mouth wide open in a constant yawn. The arms reach out but the hands hang down in a powerless attempt to catch their prey. The eyes are open but weak, the empty gaze is focused to nowhere. The legs move slowly and drag along the unwilling feet… and opposed to a ghoul this specimen doesn’t even seem to have a consciousness. This is like I feel during summer. The heat is pressing on my mind, makes me cheerless, almost pulls me deep into heavy melancholy. And every August ends in the same way: In me trying to drag myself through everyday life with almost no motivation at all. Within a few weeks I managed to transform from an optimistic person who loves to laugh into a mumbling, pessimistic blob who scares away his fellow men with imaginary dragon roars. I haven’t really seen the sun for quite a while now. I have been hiding behind the curtains and roller blinds. Here the heat has a hard time to get through. Only in the early morning and late evening hours I come out voluntarily. Then, when the temperatures cool down a bit and the sun loosens it’s merciless grip to the earth for a few precious hours. And so I am hiding from the sun and space out in thoughts that become darker every day. And I’m counting. Not 3 whole weeks until September and not so much longer until the liberating autumn will come. What would I give for a nice wind that clears the head, pushes away my dizziness and tidies up all the heat dust of the last few weeks. But autumn isn’t here just yet and I keep on mutating to a nasty, gloomy demon. Maybe a little granola will help to give me enough power for the final spurt of summer. 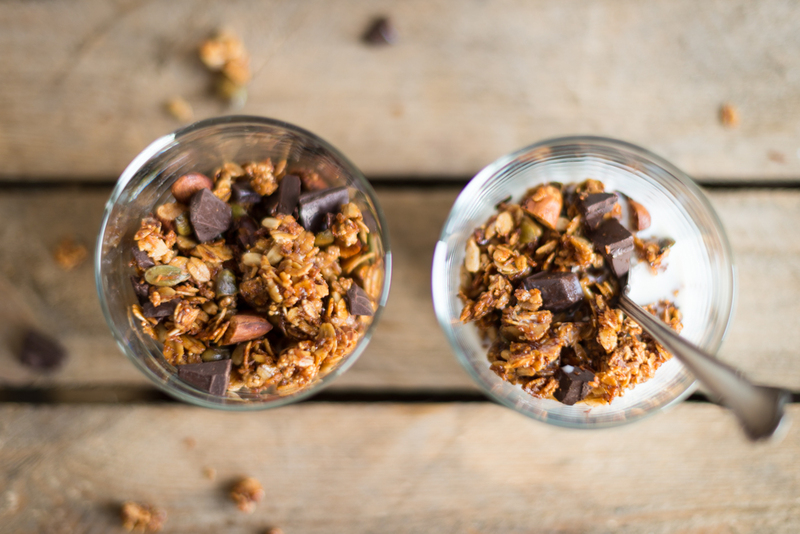 A granola packed with nourishing nuts, crunchy oat flakes, pleasant condiments, and soul warming chocolate. 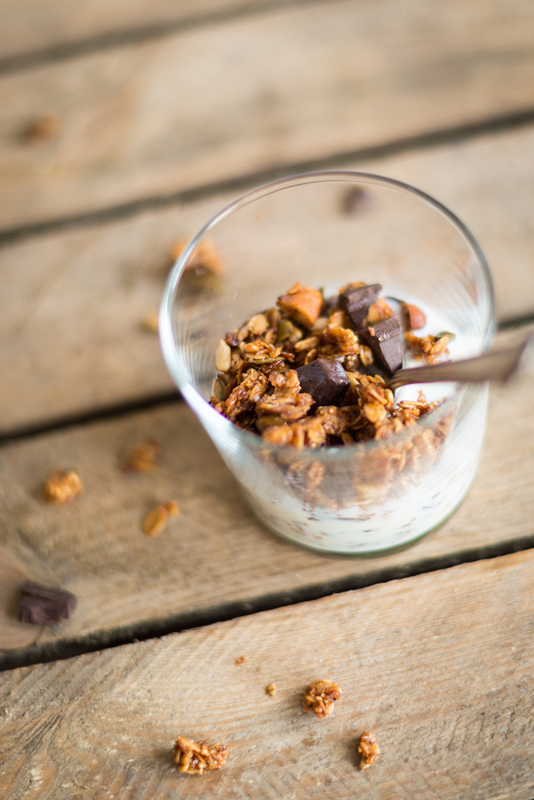 You can enjoy it pure or sink it in milk, nut milk or yoghurt to go treasure hunting for those precious little chocolate chunks, armed with nothing more than a spoon. And when I catch my first crunch-accompanied piece of cocoa and it melts heavenly on my palate, I am finally filled with a little bit of happiness again. The ever-so-mischievous smile is back, the demon inside is pulling away and makes space for sparkling optimistic thoughts. If I think about it now: Is is so nice to enjoy these precious summer evenings outside, while we still can. And tonight we will even be able to catch a glimpse of the Perseids that make their dance across the sky. A little bit of star gazing cannot be bad. Life actually is wonderful! Preheat the oven to 150°C (300 Fahrenheit). Put a baking paper on a baking tray. Grind the cardamom seeds in a mortar. Mix all the ingredients (except the chocolate!) in a bowl and spread them onto the baking tray. Bake for 30-45 minutes and stir the mixture every 10 minutes or so to let it brown evenly. Let it cool down completely, roughly loosen it up with a spoon, and then add the chocolate chunks. 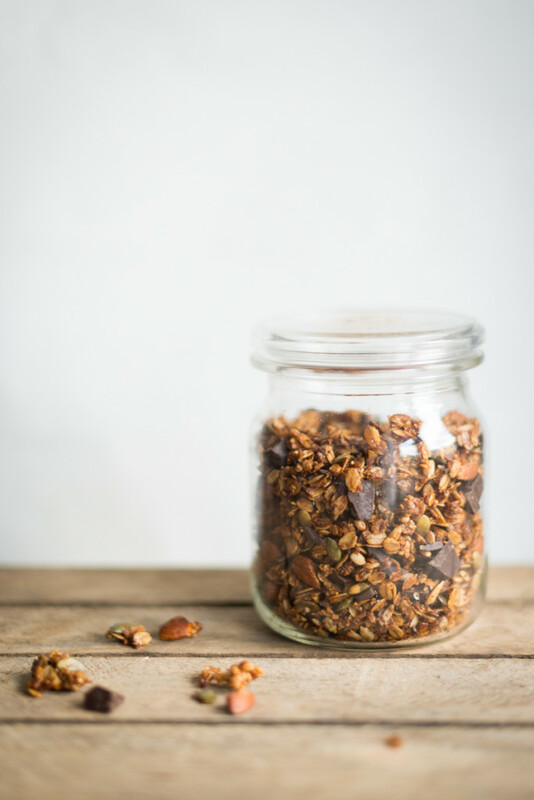 Kept in airtight containers it will stay crunchy and can last up to a few months, but trust me: it won’t! 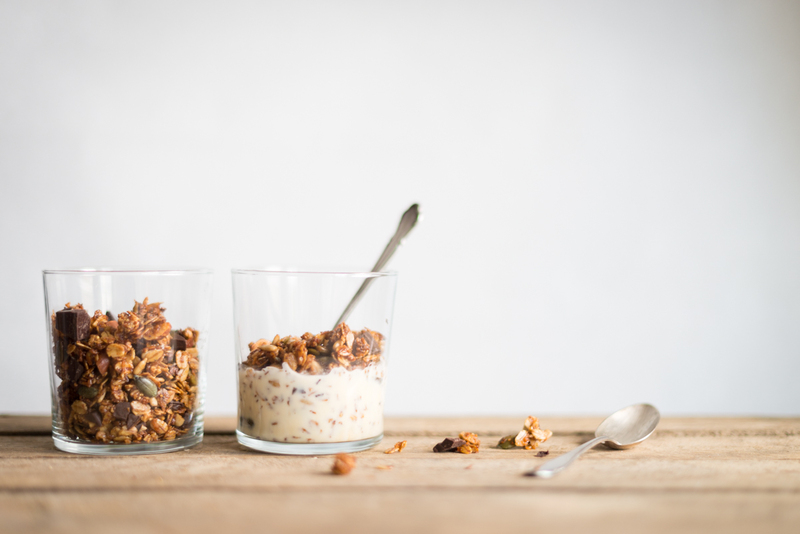 Eat it pure or enjoy it with milk, nut milk, yoghurt or this comforting coconut pudding if you like (recipe only in German, sorry). 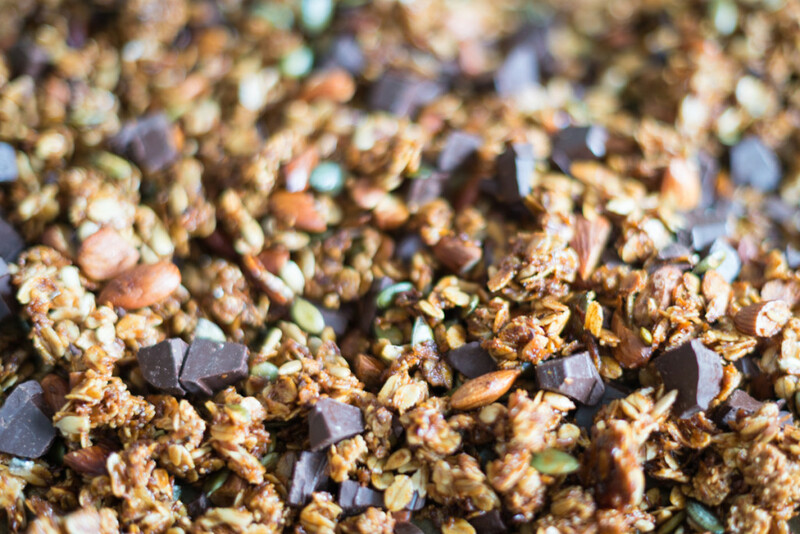 If your heart and soul need extra care you can add 1-2 tbsp cocoa powder to the granola mixture before baking it. This is what Heaven must taste like!